Want to make the most of your kitchen windows with blinds? It's no wonder they are the kitchen window dressing of choice. Unlike curtains, blinds are practical, easy to clean and let in lots of light. What's more, they're affordable and perfect for adding a splash of colour to a plain room. 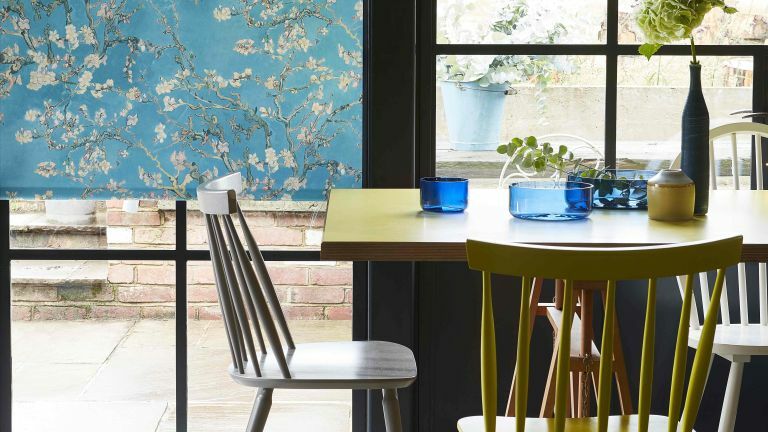 And while there are tons of designs to choose from, it's not all about looks when you're picking out blinds for such a hard-working space as a kitchen: you have to consider how the fabric might cope with grease and oil splatters, moisture and heat. Luckily, fabric technology has come on leaps and bounds, with moisture-resistant coatings, light reflecting options and even insulating properties now available. Ready-to-fit blinds will obviously be cheaper, but you may find that made-to-measure is your only option. For a professional finish, consider a company that will measure up and install for you as part of the price. Find more kitchen window dressing ideas in our design gallery. Find more information about how to choose the best Roman blinds in our practical guide. Plain blinds work well with both contemporary kitchens and traditional kitchen styles. Add a burst of colour to a neutral scheme or choose a colour to complement an existing scheme to update the look. What's more, adding a bold colour in something as easy to change as a blind means you can dare to be more adventurous with colour than you otherwise might. Find more practical info about choosing roller blinds in our guide. 4. What about a non-fabric option? Venetian blinds, both practical and stylish, are usually made from wood, plastic or metal, which makes them easy to wipe down so they won't harbour germs, dirt or the usual kitchen smells. The adjustable slats provide lots of options for privacy and light control, and when not in use, you can pull them up almost out of sight, which is great if you have garden views. These aluminium Venetian blinds in teal cost from £81, Style Studio. Find out more about picking the best Venetian blinds in our guide. If you aren't sure how to add colour and interest to your kitchen, let the blind be the catalyst. Choose accessories in two or three key colours from the print to tie in with the rest of the kitchen scheme. Love to introduce pattern and colour but also change your mind regularly about how you want your kitchen to look? This Almond Blossom Blue Blackout blind is on Bloc Blinds' Fabric Changer Roller Blind, meaning you can take off the old fabric and replace it with a new one. Clever. The popularity of French, bi-folding and sliding doors has pushed blind manufacturers to up their game, creating ever more innovative blind solutions – including those that fit into the door frames themselves, or ones that roll from the top downwards instead of from the bottom up to let in extra light – or to provide shade where needed. Consider the effect you want to create – the more material used, such as in Roman blinds, the more traditional the room will feel; the more streamlined (think Venetian or roller blinds), the more contemporary the finish. Check our our guide to blinds and curtains for glazed doors for more ideas.